The Peugeot iOn is a small four-door city car but it costs 33,800 euros. PARIS -- Peugeot says drivers of its new iOn electric car can be green and also save money. The French brand is touting low running costs of the battery-powered iOn to offset the car's high sticker price. The iOn is a small four-door city car but it costs 33,800 euros -- for that price a buyer could purchase a Mercedes-Benz C class. Peugeot expects most iOn customers will lease the vehicle for 499 euros a month (415 pounds in the UK), a price that includes the expensive 88-cell lithium ion battery pack, servicing and maintenance, and a 50,000 km warranty. The company says running costs for the iOn will be between 1.50 euros and 2 euros per 100 km, one-fourth the cost of an equivalent gasoline or diesel model. If the car's batteries are recharged overnight when electricity is generally cheaper, recharging costs can be reduced further. Drivers of the iOn will also benefit from savings in cities that offer EV cars incentives such as exemption from congestion charges and free parking. In London for example, an iOn driver would save the 1,696 pounds (nearly 2,000 euros) annual congestion charge and in London's Westminster district which offers free charging and free parking for electric cars for a small annual fee, drivers would save another 2,000 pounds (about 2,300 euros) a year in parking fees. Private buyers will not be the main target for the car, said Jean-Francois Mascarau, who is is charge of EV customer sales at PSA. Even by 2015, only 10 percent of iOn customers will be private buyers or leasers. Peugeot aims to lease the iOn to courier companies, public utility providers, local governments, car sharing companies and car hire firms. The iOn has a top speed of 130 km/h from its electric motor, which has a power output of 49kW, equivalent to 67 hp. The iOn drives like a gasoline or diesel car with an automatic transmission. There is no engine starting procedure and the acceleration is above average for such a small car because of it has a lot of torque. The car is so quiet that wind and road noise from its tires are the only audible sounds, plus the soft whine of the electric motor. Peugeot says the iOn's average range of 150km is sufficient to cover the majority of a motorist's daily trips, 90 percent of which are less than 56 km. Peugeot says that in severe conditions, such as city driving in hot weather with the air conditioning on, or during faster highway driving with heater on, the range could be as low as 75km. 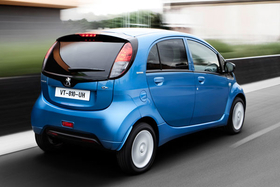 The iOn is a rebadged Mitsubishi i-MiEV and is built in Japan alongside its sister model, the Citroen C-Zero. All three cars will launch in Europe in December. Peugeot expects EV sales to account for between 4 percent and 5 percent of European new car sales by 2020, although the company acknowledges that the success of EVs market will be very dependent on tax incentives offered to buyers, the introduction of a charging infrastructure and the fluctuating price of fossil fuels. The iOn can be serviced at regular Peugeot dealers. Its battery pack can be charged in six hours using a traditional household socket. A quick charge using a special charging unit provides a 50 percent charge in 15 minutes, or 80 percent in 30 minutes.